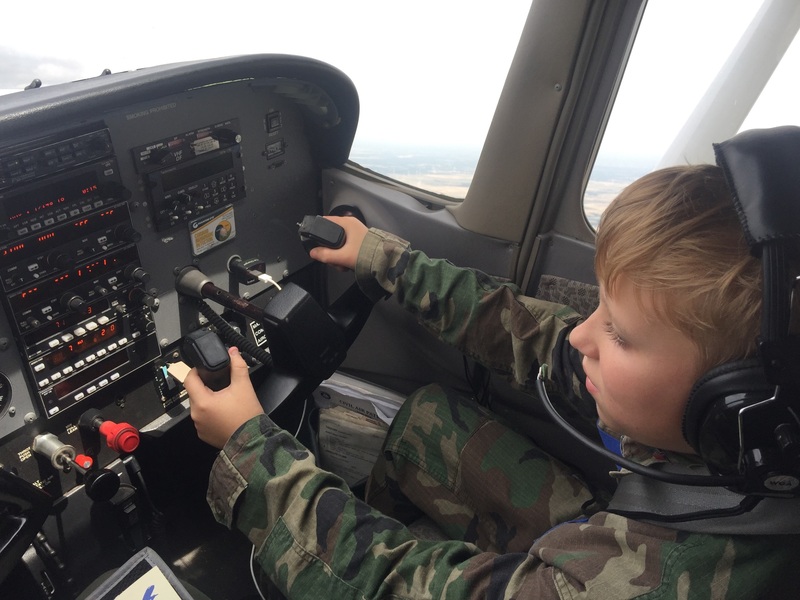 The Civil Air Patrol Cadet Orientation Flight Program is designed to introduce our cadets to general aviation through hands-on flights in single engine aircraft and gliders. The program is limited to those cadets under 18 years of age. The program is voluntary and is intended to be motivational and to stimulate an interest in general aviation an other aerospace activities. The Cadet Orientation Flight Syllabus consists of ten flights, five in gliders and five in single-engine aircraft. For our squadron, flights in single-engine aircraft are conducted locally, at the Denton Municipal Airport. Glider flights generally are conducted at Bishop Field near Decatur. To receive credit for completing a syllabus flight, the cadet will occupy the front right seat and the flight must complete 80% of the objectives. Once a cadet has completed a syllabus flight, the cadet cannot repeat that flight from the front seat. However, there are no limitations to the number of flights a cadet may take as a rear-seat passenger. Cadets are encouraged to participate in these observation flights. Scheduling is coordinated between Cadet Programs and Operations. The flights can be canceled for any number of reasons, such as weather, mechanical problems with the airplane, an actual search mission requiring priority use of the airplane, or pilot illness, just to name a few. During the winter, it may be sunny without a cloud in the sky, but it may also be too cold (or too hot) to fly. Conditions will dictate whether all the flights are canceled or only some of them. Changing conditions may cancel morning flights and allow afternoon or visa versa. All attempts will be made to contact the cadets and parents before leaving home if flights are canceled. Please make sure that there is a cadet and a parent email addresses in eServices and that they are accurate. If we can’t contact for you, you might show up at the airport and no one will be there. The only requirement about uniforms is that all occupants in the aircraft must wear a complete approved Civil Air Patrol uniform. It doesn’t matter which uniform. If you wanted to wear your Mess Dress uniform, that would be ok but, obviously not advised. Cadets will wear their BDU unless otherwise advised. It is strongly advised that outerwear appropriate for the weather conditions be worn. For cadets or pilots in a CAP-distinctive uniform, there are no outerwear restrictions. For pilots in USAF-style uniforms (green flight suit), appropriate USAF-style outerwear is mandated if worn (i.e. no civilian outwear). The general guidance for determining whether, or the type of, outerwear that one should remain comfortable while walking a distance of 3000 (over 1/2 mile) feet in the expected weather conditions. When possible, one or more briefers (who are pilots in the squadron) will be available at the flight location on the day of the flight to review with the cadet the aviation concepts to be demonstrated during the flight. The briefers will be able to answer any questions the cadet may have about the flight. Otherwise, the pilot will conduct the briefing. The cadet should arrive at the flight location 1 hour prior to the cadet’s scheduled flight time. Pay close attention to email chains during the planning period and respond promptly and completely. Expect the plan to change several times before showtime. Stay alert for possible cancellation before leaving home. Have CAPID membership card with you. Have your eServices password available. Arrive at flight location 20 minutes before scheduled flight time to review briefing material. Remember airport safety rules including no running, no cover on the flight line and keep your eyes open and looking around for spinning propellors. Cadets are NOT welcome to wander around the flight line. Parents please keep close control of younger siblings.